Flemeth: "It is only when you fall that you learn whether you can fly." First off, I have to admit something. And it's embarrassing, given the topic of this blog. So here goes: I skipped Dragon Age II. Yep. Just zoomed right on by it in my first playthrough from Origins to Inquisition. "Hello, Mr. Templar. This thing? Oh, it's not a staff. Just a stick. My... backscratcher. Take care! Byeee!" I had a lot of good reasons at the time—ahem, or so I told myself—the game had gotten mixed reviews, and the first hour or so of halfhearted gameplay didn't draw me in. But the real reason I skipped it was simply that I couldn't wait any longer to play Dragon Age: Inquisition. So I skipped it. And didn't look back for a year, in which I basically just played DAI over and over again (intermittently punctuated by Mass Effect trilogy replays or other gaming forays into LOTRO, Half-Life, Jade Empire, and more). So I did that. And yeah, I was stupid. Really, really stupid. Because Dragon Age II is flat-out wonderful. In fact, when I did finally play it (in my first actual full-trilogy playthrough three months back), I loved it so much I played it three times in a row (putting my plans to jump right back into Dragon Age: Inquisition on hold). 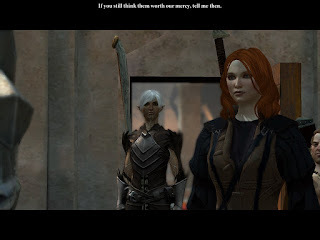 As before in Dragon Age: Origins, Dragon Age II gives you a lot of flexibility in building your protagonist, Hawke. Hawke can be male or female (mine was, as almost always with me, female, but it's also easy to imagine the player headcanoning Hawke to satisfy additional gender preferences or nonpreferences, as desired), they can fall anywhere on the Kinsey scale you'd like them to, and they can be any one of the standard Dragon Age classes, from Mage, to Rogue, to Warrior, et cetera. If Dragon Age: Origins is about making you really feel the monumental risks and sacrifices of the Grey Wardens, the few able to take action on Ferelden's Worst Day Ever (as the Archdemon returns, bringing the potentially world-ending Blight and hordes of darkspawn), Dragon Age II puts you front and center in the growing conflict between the Mages and the Templars who watch them. Suddenly, you're not evaluating the world state, godlike, drawing battle lines or strategies—you're right amidst the poor and terrified, and simply trying to make things right, moment to moment. So, especially if you play a mage, suddenly the conflict is right in front of you. And it's personal in a way that it's never been before. 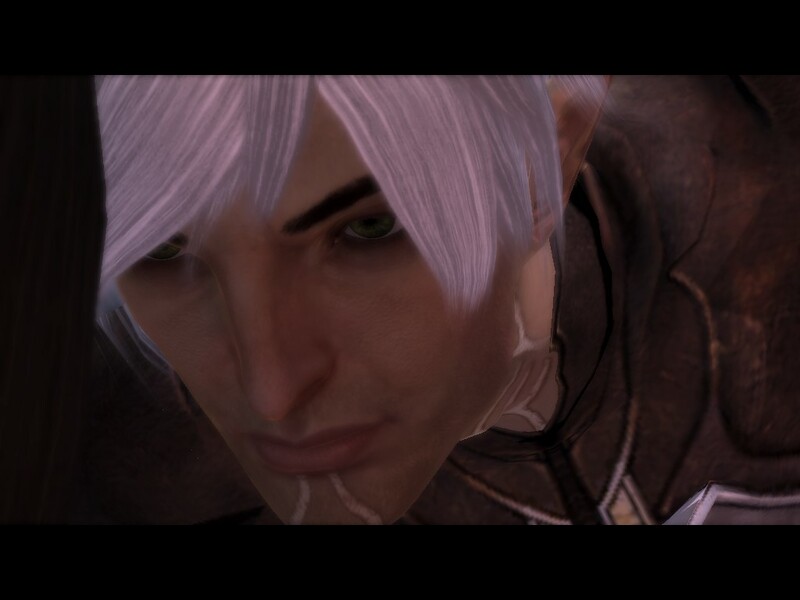 Dragon Age: Origins was a fairly traditional work of fantasy. It was very much a spiritual child of Tolkien and his world—a sprawling achievement that took you all over Thedas, from Denerim to Redcliffe, from the Dalish elves in the Brecilian forest to the dwarf-kingdoms of Orzammar, or on to the Deep Roads beneath them all. Dragon Age II, on the other hand, presents an odd yet arresting combination platter. It's a classic fantasy hero's journey in the Campbellian sense, but it's also wrapped up in the story presentation as a kind of classic Noir whodunit. Framing Hawke's adventures is a series of scenes in which Seeker Cassandra Pentaghast (a specialized warrior working for the Chantry) fiercely questions Kirkwall dwarf, author and rogue, Varric Tethras, about a recent mysterious catastrophe that was the result of the circumstances we're playing/watching before us. As Varric narrates each chapter with an appropriate amount of humor, suspense, occasional color and added drama, we're swept back into the events themselves—it's classic Noir in the best sense, and it adds urgency to the playthrough as well, as we wonder, "What happened? What was so bad that this warrior's questioning this guy like the entire world hangs in the balance?" Well, let's just say we definitely find out. We get ringside seats. The story of Dragon Age II takes place almost entirely in the Free Marches city-state of Kirkwall, a city with a complex history that has changed hands numerous times. 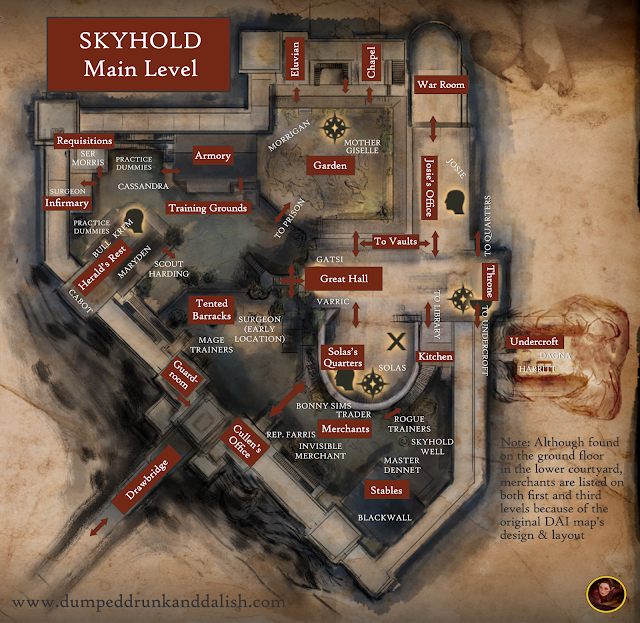 Although Kirkwall is now part of the Free Marches and not far from Ferelden, its past as a longtime Tevinter port once known as "the City of Chains" is unmissable and genuinely creepy. The city's past haunts it heavily and it's all strikingly true to the spirit of Tevinter, which is a merciless, decadent Roman-inspired empire ruled by Magisters (mages often using blood magic, and often in ominous and corrupt ways). In Tevinter, power is everything and slavery is an everyday fact, and Kirkwall is shadowed by enormous statues of suffering, enslaved and tortured humans that are everywhere you look, from the harbor to the city itself. These statues of oppression are one of the brilliant ways Dragon Age II keeps you focused on a story that's ultimately about oppression and systematic dehumanization, and how those factors can twist even the best of people overcome with rage and helplessness. The action of Dragon Age II ranges from the poor and dangerous backstreets of Lowtown, Darktown, the Docks, and the Alienage (where the elves live in semi-forced segregation), to the Gallows (Templar headquarters), to the more posh Hightown area or the political headquarters at Viscount's Keep. By the end, you'll feel like you know Kirkwall as if you were a resident yourself. 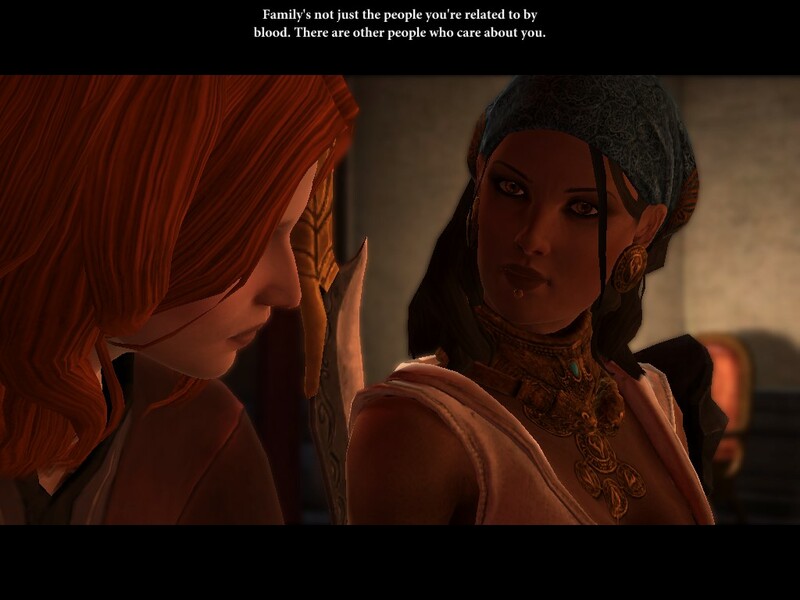 fascinating companions who joins you in DA2. DA2's cast is as rich and diverse as you'd come to expect from Bioware. 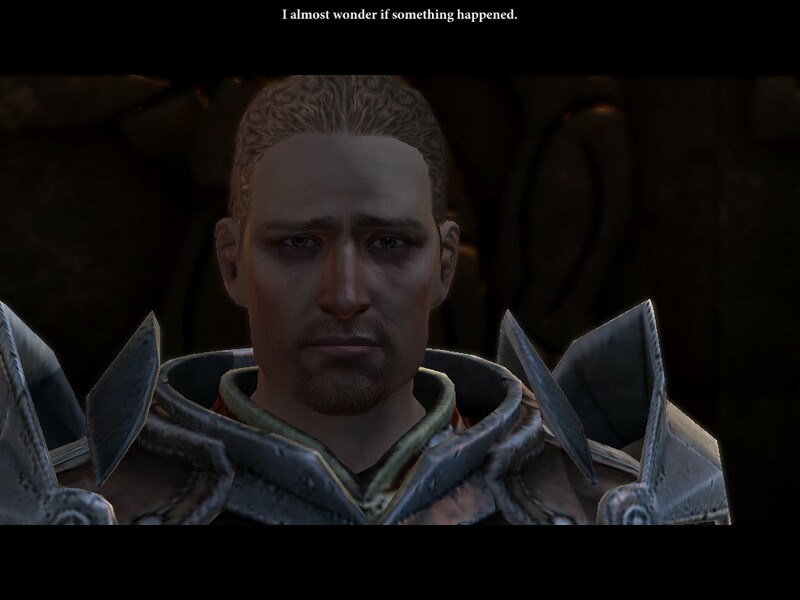 First off, there's Hawke, who's exhausted, grieving (she loses a sibling on the initial journey from Lothering), and desperately trying to hold together what family remains to her. 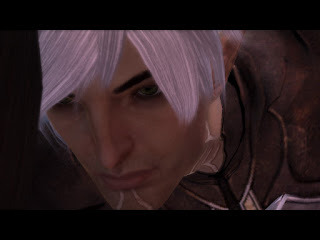 She's immediately faced with indentured servitude for a year's labor in order to simply allow her family to enter the city at all, and one of your earliest decisions will be whether Hawke becomes a part of Kirkwall's underground, or if she tries to move forward in a more lawful way. Her journey as a character will ultimately span seven years (seven years! ), and you'll share those years with a colorful cast of characters who are just as flawed, brave, brash and scared as Hawke is, from steadfast female warrior Aveline, to funny, companionable Varric. You'll also ally with passionate mage-rights apostate Anders, who returns from his hilarious turn in the Dragon Age: Origins DLC Awakening, and who's now hiding the fact that the spirit of Justice—previously a separate character in Awakening—has merged with him and is now actually sharing his body. You also meet the proud escaped Tevinter slave Fenris (an elf whose entire body was permanently etched with the magical element lyrium by his former master), stranded female rogue and pirate captain Isabela, and the gentle elf Merrill, who has been quietly banished from her Dalish clan because of her insistence upon pursuing her research into ancient elves and the centuries-old mirror that obsesses her. like listening to kittens, rainbows, and frolicking otters. surprisingly wistful, thoughtful and sweet. As is usual with Bioware games, the romances are essential, illuminating, and surprising. 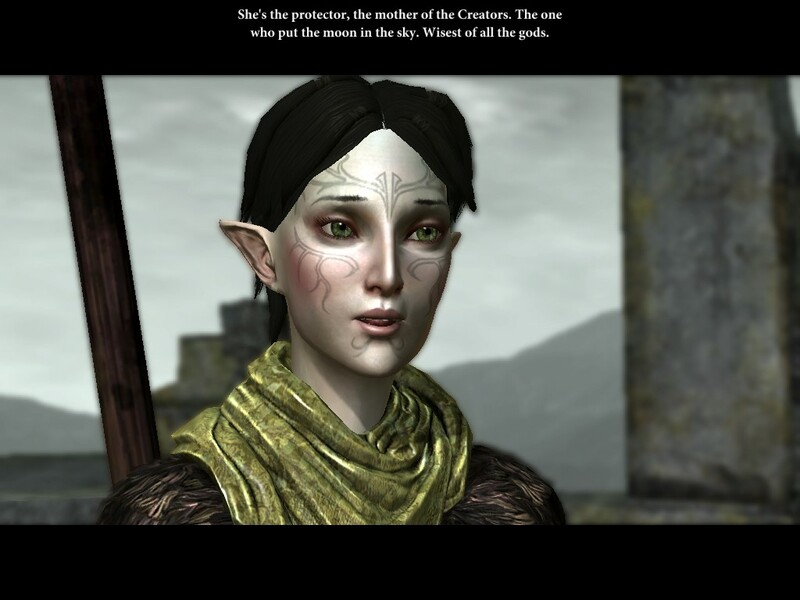 They provide glimpses into the secret hearts of your companions that you wouldn't get otherwise, and are often directly tied into the main storyline and its arc in genuinely creative ways. The addition of the option to "rival" your companions in the game (something wholly unique to DA2) also adds complexity, as it means you don't have to constantly agree with your companions in order to romance them. The "rival" concept isn't so much about antagonism as it is about intrinsic beliefs—for instance, you may find your mage Hawke "rivalmancing" magic-hating former slave Fenris simply because you are steadfast in your beliefs that magic is acceptable. Even if he can't agree with you, the sparks may fly, and if you're attracted to each other, this means a relationship is still possible, it'll just be more tempestuous than is usual in gaming. But that—once again, just adds to the game's replay value. Your conversations and romances will proceed incredibly differently depending on whether you and your object are friends or rivals. "Rivalmances" in fact often yield secrets you won't get if you only pursue the safer, more traditional friendship routes in getting to know them. Please do check out my next post for the conclusion of my thoughts on DA2. Thanks!